An outstanding city with a glare of crystal white “snow- covered Coast Mountains” and blessed with scintillating beaches is a delightful tourist destination for global nature- lovers. 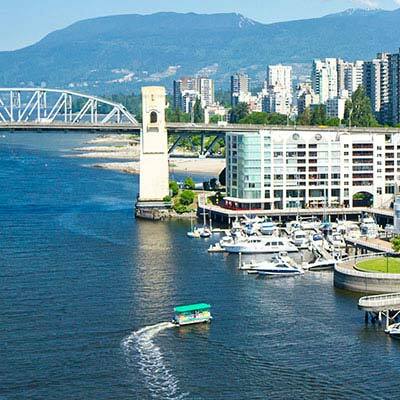 Book cheap flights to Vancouver with Lookupfare and get best Vancouver flight deals, lowest airfare ticket to Vancouver, Canada. Overwhelmingly known as a thriving West Coast Seaport of British Columbia, Vancouver is one of the beautiful, live and thick locations of Canada that invites the outdoor pursuits of all sorts. This lovely city has spectacular panoramas, snow- dusted mountains and lush- green rainforests for global tourists. Luscious deep valleys, juicy & delicious wine & dine and friendly inhabitants of this city make it an exceptional dome on the earth. Modern art sculptures, ancient museums and classy heritage galleries displays the glorious saga of this lovely city. Book cheap plane tickets to Vancouverand make your trip a memorable one. Granville Island – It’s a picturesque place formed by an amazing history, bustling with a colorful artistic community. The island is a peninsula and shopping district in Vancouver, British Colombia, Canada and is ideally located across False Creek from Downtown, under the south end of the Granville Street Bridge. Stanley Park - Welcome to Stanley Park, city’s first, largest, and most favorite urban park! Labeled as a national historic site of Canada, the lush green park is a 405-hectare public park and is a magnificent green sanctuary in the midst of the heavily built urban landscape of Vancouver. Museum of Anthropology - A place of extraordinary architectural beauty at the University of British Columbia campus in Vancouver, British Columbia, Canada. This amazing museum is very famous for its exhibits of world class arts and cultures, an abode of provocative programming and vibrant, contemporary exhibitions, which is very worth to visit and explore on your visit to Vancouver by booking online low cost flights to Vancouver. Grouse Mountain - This is one of the North Shore Mountains of the Pacific Ranges in the District Municipality of North Vancouver, Canada. From sophisticated entertainment to pristine nature, Grouse Mountain is the foremost all-in-one, destination for all season, with something for everyone. Kitsilano Beach – Lovingly known as “kits” Beach, is situated on Cornwall Ave at the north end of Yew St. This scintillating beach is one of the most renowned beaches in Vancouver, particularly in the warm summer months. Beach volley, swimming, sun bathing and strolling on the cool sands are some adventure which travelers love to enjoy here. You need not worry about booking cheap airline tickets to Vancouver and enjoying your vacation as Lookupfare offers you several Vancouver flight deals. Last minute flights to Vancouver are bursting with people enthusiastic to explore the young, vibrant and diverse city that grins with pristine natural beauty. Whether you’re heading for the snowcapped mountains, leisure in the park or enjoying the exotic city nightlife, there are plenty of things to do in Vancouver anytime of the year. Book one way flight deals to Vancouver and hotel well in advance for the best rates.